The Prime Minister Shri Narendra Modi visited Itanagar as a part of his visit to Arunachal Pradesh, Assam and Tripura. He laid foundation stone for Greenfield Airport at Itanagar and Sela Tunnel. He launched DD Arun Prabha Channel. He also unveiled several other development projects in the state from IG Park in Itanagar. PM also inspected Loin Loom operations there. 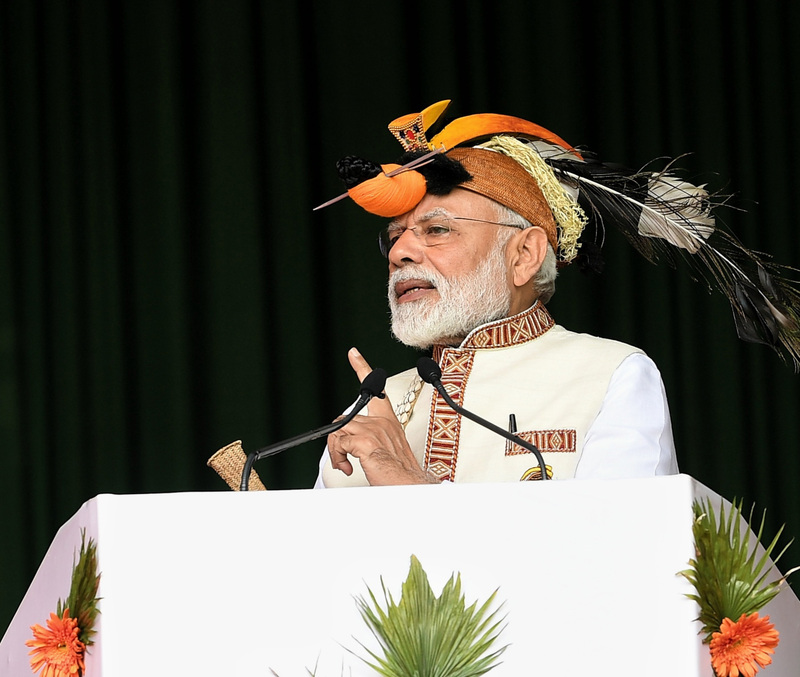 Speaking on the occasion, PM said that Arunachal is the land of rising sun. It’s the confidence of the country. PM said, “Today I got opportunity to unveil projects worth more than Rs 4000 crore”. Additional projects worth Rs. 13000 crore is in progress in the state, he added. 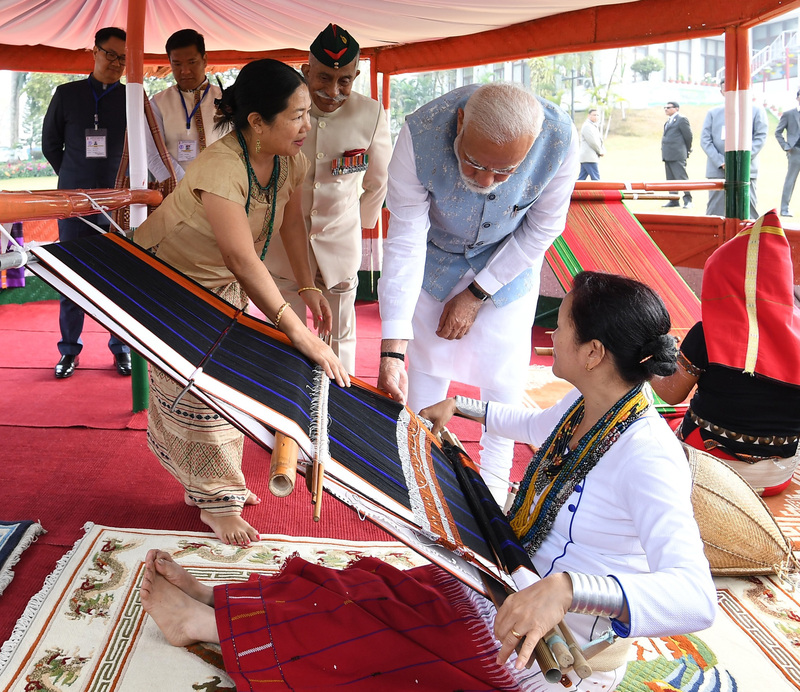 PM asked people to compare 55 months of his Government with 55 years of the previous Governments with respect to developmental activities in Arunachal Pradesh and other North Eastern states also. 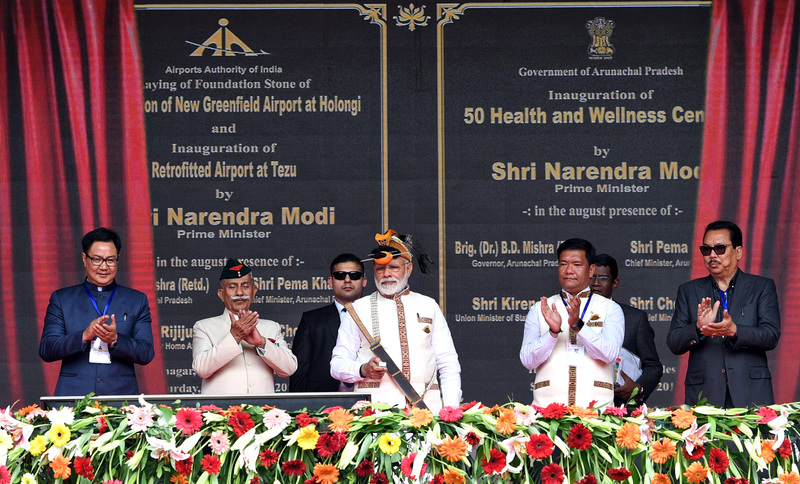 PM laid the foundation stone for the construction of Greenfield Airport at Hollongi and inaugurated retrofitted Tezu airport. The terminal at Hollongi will be constructed at a cost of Rs 955 crore with an area of 4100 sq m and has peak handling capacity of 200 passengers per hour. During the occasion he said that from today connectivity of the state will improve. At present, only way to reach Itanagar by air is to get down at Guwahati Airport and travel either by road or by Helicopter service. He also said, “Tezu airport was built 50 years back but no government envisioned to connect people of this state with other parts of the country. We expanded the airport by spending around Rs 125 crore for this small airport”. Tezu airport is ready to give services to the people of Arunachal, he added. Udan scheme will benefit people through cheaper flights. Not just airports, the lives of people in Arunachal Pradesh will improve vastly with new and improved rail and road facilities,” says PM. Prime Minister laid the foundation stone of Sela Tunnel in Arunachal Pradesh. It will provide all weather connectivity to Tawang Valley and reduce the travel time to Tawang by an hour. It will be constructed at an estimated cost of Rs 700 crore. Prime Minister said that rail and road dual use bridge at bogibeel has brought Arunachal more closer to the mainland. Government is working on almost Rs1000 crore worth of projects for improving connectivity of the state. He informed that in the last 2 years around 1000 villages have been connected through roads. The work on Trans Arunachal highway is also under progress, he added. In an effort to connect all state capitals of North East states, Itanagar has also been connected with the Railways. Arunachal Express is running weekly twice from Naharlagun. Survey is conducted in 6 places in the state for laying of new rail line of which survey in 3 places are completed. There is also plan to connect Tawang by rail. Prime Minister declared 100% household electrification in Arunachal Pradesh under Saubhagya scheme. PM also dedicated 110 MW Pare Hydroelectric Plant in Arunachal Pradesh to the nation. “We are emphasizing on power generation. Today 12 hydro electric projects of 110 MW were inaugurated which will not only help Arunachal Pradesh but also adjoining states,” says PM. He recalled, “Yesterday I requested people to share their photos of north east visit. Within few seconds 1000s of photos were tweeted by the people including foreigners. He said that the projects unveiled today will not only improve the ease of living here but also improve tourism and thus increase employment opportunities. 50 health and wellness centers in Arunachal Pradesh was inaugurated by PM. He said that through Ayushman Bharat scheme we are creating health and wellness center. Health services will improve through these centers. Through Pradhan Mantri Jan Arogya Yojana (PMJAY), within 150 days almost 11 lakh poor people have benefitted, he added. PM said that through PM Kisan Saman Nidhi announced in the budget, those with less than 5 acre will get Rs 6000 every year in their bank accounts in three installments. He said that his government will also support the efforts of Arunachal Pradesh Government in promoting Organic agriculture in every possible way. A New dedicated DD Channel, for Arunachal Pradesh – DD Arun Prabha was launched by PM at IG Park, Itanagar. The channel will be the 24th channel operated by Doordarshan. He said that through this channel news of even remote places in the state will reach the people. He also laid Foundation stone for a permanent campus of Film and Television Institute of India (FTII) at Jote, Arunachal Pradesh on this occasion. He summed it up by saying, “Arunachal Pradesh is India’s pride. It is India’s gateway, and I assure you all that we will not just ensure its safety and security, but also put in on a fast-track to development”. A land associated with the rising Sun, brightness and a land that is home to courageous and warm-hearted people. Efforts are on, for not one, but two airports in Arunachal Pradesh! 55 years of one party and 55 months of BJP... in all spheres of Arunachal Pradesh’s development, our work has been quicker and all-inclusive. One of the prime considerations behind the impetus towards Arunachal Pradesh’s all-round development is to make the state an even bigger hub for tourism. More people from India and across the world should come to Arunachal!